"Merely listening to this CD as I fall asleep at naps or at night has opened up my psychic powers and understanding a thousandfold." from D.G. The Lesser Ritual of Banishment, also known as the Lesser Pentagram Ritual, is one of the basic tools of the modern magician. It can be used as a daily practice, as a cleansing ritual, as the starting point for a more involved invocation or as a special invocation of its own. This CD was created following very rigurous traspositions of magical symbolism and numerology into musical arrangements and pure sound design. 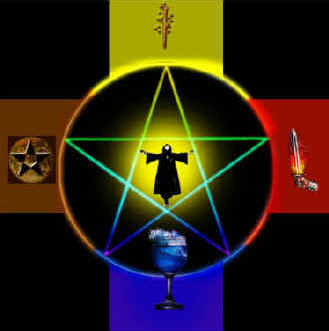 Each aspect of the ritual is represented in the sounds and music that you hear. The spoken and sung words are performed by Ricardo Flores, a very experienced magician, who brings the ritual and the vibrations to shining life. The CD can be used as pure ambient material to send you quietly into a magical space. You can also be guided by it as you perform the ritual yourself. If you have a lot of experience with Magick, you will find that this CD will open a new space for you to rediscover a sequence that you may know by heart. If you are brand new to Magick or you are simply curious, this CD may show you a glimpse of what true Magick is and what it is for.